The Damn Thing - ZineWiki - the history and culture of zines, independent media and the small press. The Damn Thing was a science fiction fandom fanzine by T. Bruce Yerke published in Los Angeles, California, U.S.A. The first issue of The Damn Thing appeared in November 1940. In that issue the editor writes, "I haven't bought or read a professional scienti-fiction magazine since the middle of 1939. They became so putrid I got sick." Instead, the editor is much more interested in the activities of fandom itself. Five issues of this title appeared. Contributors included Ray Bradbury (Futuria Fantasia), who had work in four of the five issues, including art work and cover drawings; Ewing Brown, Ted Burk, Edwin Chamberlain, Walt Daugherty (Shangri L'Affaires), Raymond Van Houten (Tesseract, Fantasy-Times), Arthur Louis Joquel II (Specula, Sun Trails), writing as "Fywert Kinge", Damon Knight, John B. Michel ( The International Observer of Science and Science Fiction, Terrible Tales of Tittering Terror), Jack Chapman Miske (Scienti-Snaps) and writing by several obvious pseudonyms, including Eustace Bilgewater, Rigour Fungus, Prof. Stinkywitz, and Carleton J. Fassbeinder, a frequent pen name of Yerke's, and editor of his own fanzine Bedside. There is much discussion of fan events, such as a movie night in which a projector being run by Ray Harryhausen, Arthur L. Joquel (editor of FMZ Digest, Specula, and Sun Trails) and Yerke almost catches fire; criticism of New York State fans and the goings-on there; and criticism of Fantasy Amateur Press Association fanzines. 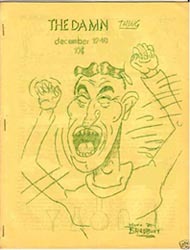 This fanzine was one of the very early fan publications devoted mainly to fan activities. Letters came from Louis Russell Chauvenet, Henry D. Goldman, Melvin Korshak, Lew Martin (The Alchemist), and Harry Warner, Jr. (Spaceways, Horizons). During 1941, The Damn Thing was a split zine with Shangri L'Affaires. As "Carlton Fassbeinder", T. Bruce Yerke also published Bedside. This page was last modified on 28 June 2012, at 13:55.